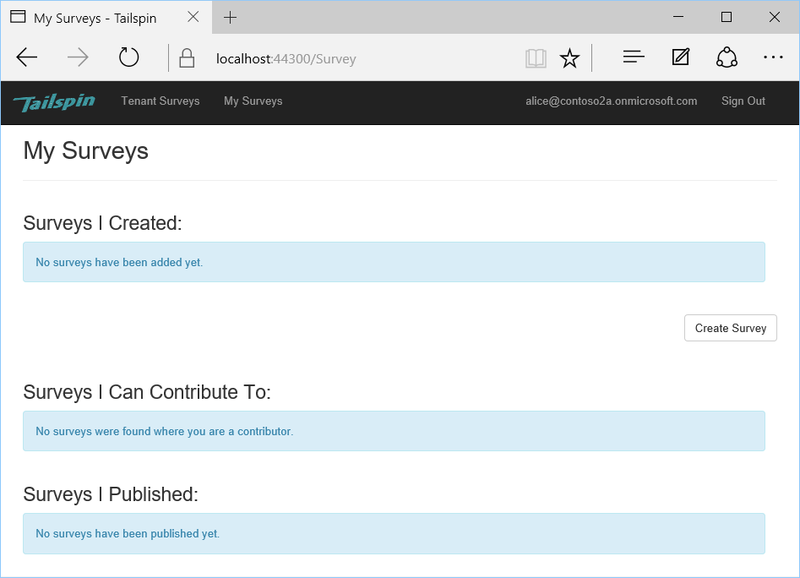 This article describes how to run the Tailspin Surveys application locally, from Visual Studio. In these steps, you won't deploy the application to Azure. However, you will need to create some Azure resources — an Azure Active Directory (Azure AD) directory and a Redis cache. 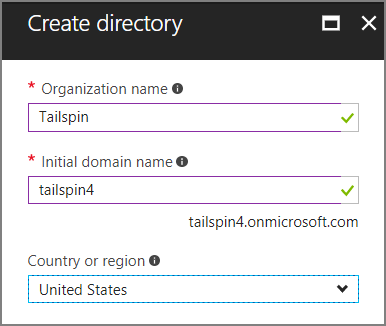 Create an Azure AD directory (tenant) for the fictitious Tailspin company. Register the Surveys application and the backend web API with Azure AD. Create an Azure Redis Cache instance. Configure application settings and create a local database. Run the application and sign up a new tenant. Add application roles to users. Tailspin is the fictitious company that hosts the Surveys application. 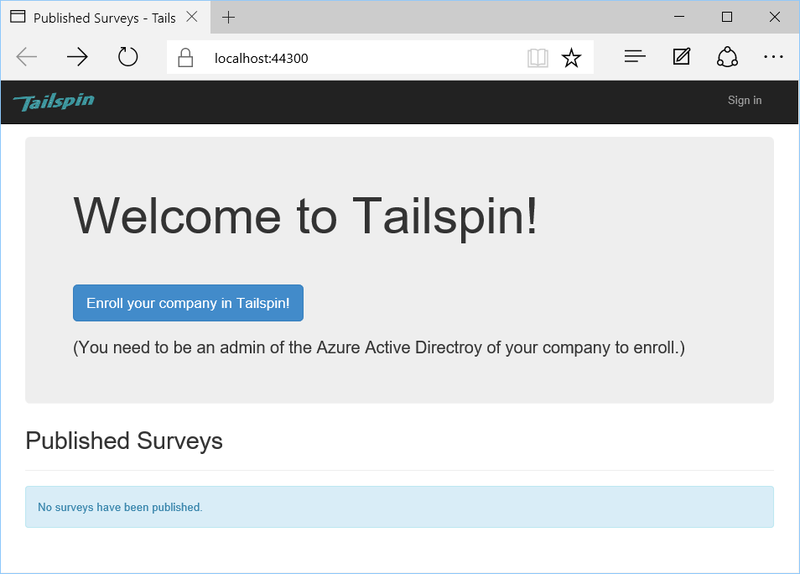 Tailspin uses Azure AD to enable other tenants to register with the app. Those customers can then use their Azure AD credentials to sign into the app. 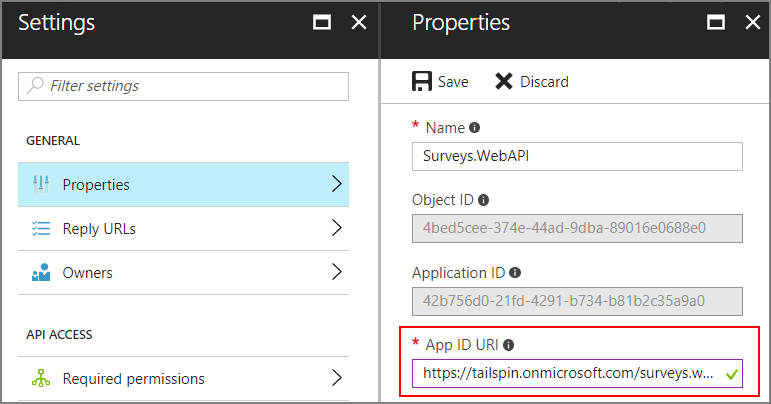 In this step, you'll create an Azure AD directory for Tailspin. Click + Create a Resource > Identity > Azure Active Directory. Enter Tailspin for the organization name, and enter a domain name. The domain name will have the form xxxx.onmicrosoft.com and must be globally unique. Click Create. It may take a few minutes to create the new directory. To complete the end-to-end scenario, you'll need a second Azure AD directory to represent a customer that signs up for the application. You can use your default Azure AD directory (not Tailspin), or create a new directory for this purpose. In the examples, we use Contoso as the fictitious customer. In the Azure portal, switch to the new Tailspin directory by selecting your account in the top right corner of the portal. In the left-hand navigation pane, choose Azure Active Directory. Click App registrations > New application registration. 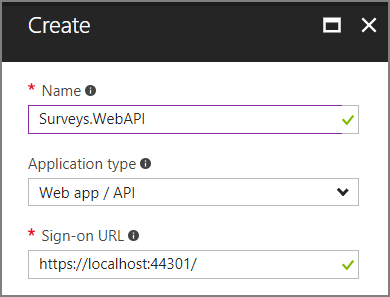 In the App registrations blade, select the new Surveys.WebAPI application. Navigate back to the App registrations blade, and click New application registration. Notice that the sign-on URL has a different port number from the Surveys.WebAPI app in the previous step. In the App registrations blade, select the new Surveys application. Copy the application ID. You will need this later. In the App ID URI edit box, enter https://<domain>/surveys, where <domain> is the domain name of the directory. In the Settings blade, click Reply URLs. Add the following reply URL: https://localhost:44300/signin-oidc. Under API ACCESS, click Keys. Enter a description, such as client secret. In the Select Duration dropdown, select 1 year. Click Save. The key will be generated when you save. Before you navigate away from this blade, copy the value of the key. The key won't be visible again after you navigate away from the blade. Under API ACCESS, click Required permissions. Click Add > Select an API. In the search box, search for Surveys.WebAPI. Select Surveys.WebAPI and click Select. Under Delegated Permissions, check Access Surveys.WebAPI. Navigate back to the Settings blade for the Surveys.WebAPI app. Add the following JSON to the appRoles element. Generate new GUIDs for the id properties. This setting adds the Surveys app to the list of clients authorized to call the web API. Now repeat the same steps for the Surveys app, except do not add an entry for knownClientApplications. Use the same role definitions, but generate new GUIDs for the IDs. Go to Azure Portal and click + Create a Resource > Databases > Redis Cache. Fill in the required information, including DNS name, resource group, location, and pricing tier. You can create a new resource group or use an existing resource group. After the Redis cache is created, navigate to the resource in the portal. Click Access keys and copy the primary key. For more information about creating a Redis cache, see How to Use Azure Redis Cache. Open the Tailspin.Surveys solution in Visual Studio. In Solution Explorer, right-click the Tailspin.Surveys.Web project and select Manage User Secrets. "WebApiResourceId": "<Surveys.WebAPI app ID URI>"
"Configuration": "<Redis DNS name>.redis.cache.windows.net,password=<Redis primary key>,ssl=true"
AzureAd:ClientId: The application ID of the Surveys app. AzureAd:ClientSecret: The key that you generated when you registered the Surveys application in Azure AD. Redis:Configuration: Build this string from the DNS name of the Redis cache and the primary access key. For example, "tailspin.redis.cache.windows.net,password=2h5tBxxx,ssl=true". Save the updated secrets.json file. Repeat these steps for the Tailspin.Surveys.WebAPI project, but paste the following into secrets.json. Replace the items in angle brackets, as before. In this step, you will use Entity Framework 7 to create a local SQL database, using LocalDB. Navigate to the Tailspin.Surveys.Data project. To run the application, start both the Tailspin.Surveys.Web and Tailspin.Surveys.WebAPI projects. In Solution Explorer, right-click the solution and click Set Startup Projects. Set Action = Start for the Tailspin.Surveys.Web and Tailspin.Surveys.WebAPI projects. Click Enroll your company in Tailspin. Sign in to the Azure AD directory that represents the organization using the Surveys app. You must sign in as an admin user. The application registers the tenant, and then signs you out. The app signs you out because you need to set up the application roles in Azure AD, before using the application. When a tenant signs up, an AD admin for the tenant must assign application roles to users. In the Azure portal, switch to the Azure AD directory that you used to sign up for the Surveys app. Click Enterprise applications > All applications. The portal will list Survey and Survey.WebAPI. If not, make sure that you completed the sign up process. Click on the Surveys application. Select one or more users and click Select. Select the role and click Select. Repeat the same steps to assign roles for the Survey.WebAPI application. A user should always have the same roles in both Survey and Survey.WebAPI. Otherwise, the user will have inconsistent permissions, which may lead to 403 (Forbidden) errors from the Web API. Now go back to the app and sign in again. Click My Surveys. If the user is assigned to the SurveyAdmin or SurveyCreator role, you will see a Create Survey button, indicating that the user has permissions to create a new survey.